If you're at all interested in sports, or chiropractic, you may have noticed in your Internet travels graphics featuring some of the biggest names in sports. The "Get Adjusted" campaign features quotes from athletes and other celebrities who have found chiropractic care valuable and want to share their experience with the public. So far, the campaign includes familiar faces such as Tom Brady, Tiger Woods, Michael Jordan, Jerry Rice, Decathlon gold medalist Dan O'Brien, Joe Montana, and even Arnold Schwarzenegger. It's true that "Ahnold" is not really an athlete these days, but the first name on the list, Tom Brady, certainly is. As quarterback for the New England Patriots, he has been an NFL Most Valuable Player and has earned similar MVP awards in two of the four Super Bowl games he's played in (winning 3). Brady holds the NFL record for the most touchdown passes thrown in a regular season and has a career passing rating of 92.9. Plus, he's been named as Sportsman of the Year by both Sports Illustrated and The Sporting News. He's a veritable sports superstar. The quote that graces Tom's "Get Adjusted" graphic says it all: "Chiropractic just makes you feel so much better. When I walk out of the clinic, I feel like I'm about three inches taller and everything's in place. And as long as I see the chiropractor, I feel like I'm one step ahead of the game." Brady joins many athletes, including all of the athletes participating in the recent Olympic Winter Games, in being able to take advantage of chiropractors' knowledge of human anatomy to help them heal faster from injuries, prevent future health problems, and even improve their athletic performance. Chiropractic care became an official part of the Olympic training sports medicine program in 1980, and was offered onsite to athletes as one of the core services at its Polyclinic in Sochi. 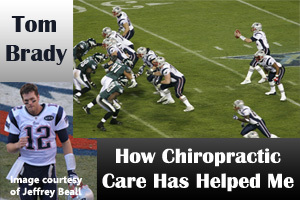 Nothing that Tom Brady has said about chiropractic care will come as no surprise to Dr. Michael Miller, a graduate of the prestigious Palmer College of Chiropractic, who has been the chiropractic team physician for the Patriots for the past 30 years. He works with anywhere from 30 to 40 Patriots players before each game and is available for specific injuries during the game. He has been to seven Super Bowl games with the team and is the proud possessor of three Super Bowl rings and four championship rings. Miller was the first chiropractor to work for an NFL team 30 years ago, but now every team in the NFL has at least one chiropractor on its full-time staff. Chiropractic is a natural form of therapy that's a great fit for elite athletes, who are in a sense like high-performance racing cars. They're fast, but their bodies are also subjected to tremendous forces when they perform, both during training and competition. These athletes simply can't rely on drugs to keep playing and most wouldn't even if they could. Much of Dr. Miller's work is done pre-game, making adjustments to players' knees, shoulders, ankles, and backs to help them avoid injury. As he says, "Their job is to get banged and be tackled. They are basically getting beaten up each game. They understand the importance of a chiropractor and see how it allows them to play longer." Longer, and better. Many athletes in many sports have joined Tom Brady in telling their own stories and offering their endorsements. They recognize that chiropractic care has helped them be more injury-free and kept their bodies performing more optimally, which has made them better at their sport over the course of their careers. Even if you're not a professional athlete, you too can benefit from regular chiropractic adjustments. Whether chiropractic care ultimately helps to improve your golf or tennis game, or just helps you recover from "overdoing it" during the weekend, isn't that something you'd want to investigate? To learn more, give us a call at (303) 776-6767!